A Northwestern fencer lands a touch. The Wildcats hosted the 2018 Remenyik Open in Ryan Fieldhouse. 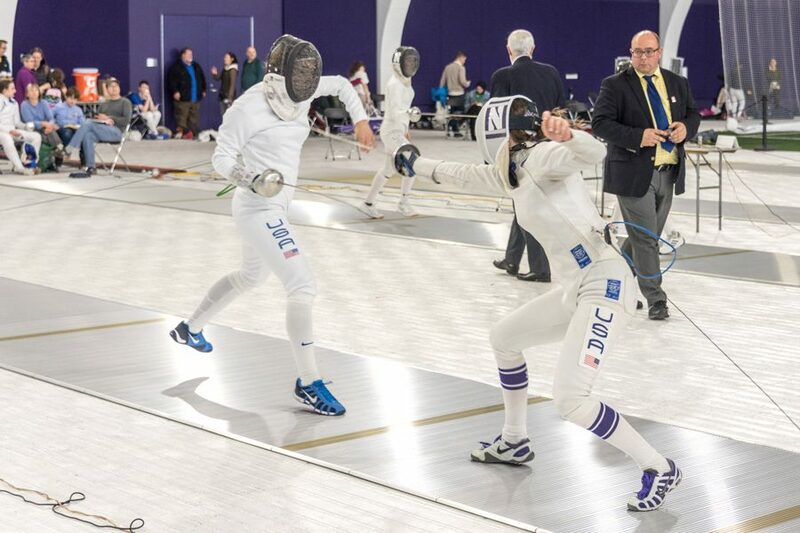 After a stretch of over 1080 days, Northwestern held its first fencing event on campus since Halloween 2015 this weekend with the 2018 Remenyik Open. In a competition featuring not only college fencers, but also fencers of all ages and skill levels, the Wildcats impressed in their events. NU had competitors in six events over the weekend and had nine top-three finishers. In the final bout of the weekend, junior epee Pauline Hamilton faced Margherita Guzzi Vincenti — a former four-time All-American and NCAA Champion at Penn State — in the final of the Division I-A epee event. Neither Hamilton, who had not lost at all Sunday, nor Vincenti were able to gain the upperhand throughout the bout as it went down to the final point. During the final battle, Hamilton and Vincenti waited each other out until Hamilton was able to go in for a decisive touch and claim the 10-9 win. The first-place finish was Hamilton’s third ever triumph at the Remenyik Open. In 2016 and 2017, she claimed first in the junior epee competition. In addition to Hamilton, sophomore sabre Alexis Browne also claimed a gold medal. After finishing in fifth Saturday in the junior sabre event, the New York native earned her first-place prize after beating freshman Robyn Song in the Division I-A sabre final Sunday. The Division I-A women’s sabre event featured the most Cats on the podium as five of the top six finishers were from NU. Senior Maddy Curzon was tied for third, freshman Abigail Swallow was in fifth and graduate Emine Yücel in sixth place. Curzon and Swallow both finished with perfect records in pool play. In the Division I-A foil event, the Cats had six of the top 11 finishers with sophomore Sarah Filby highlighting the group with a third place result. Senior Sharon Chen, sophomore Justine Banbury and senior Yvonne Chart finished in fifth, sixth and seventh, respectively, while junior Amy Jia came in 10th and freshman Alyssa Chen was in 11th. In the junior events, Swallow was the runner-up in the sabre event while freshman epee Ananya Gupta finished in second in the epee event. Freshman epee Maggie Snider also finished in third place in the epee event. “It is great for the team to be able to be here and really feel at home, have their friends here, have their family come support them and be able to showcase their sport to the Northwestern community,” Moss said.